The Iran Hostage Crisis: The Shah and the C.I.A. On November 4, 1979, a group of Iranian students stormed the U.S. Embassy in Tehran, taking more than 60 American hostages. The immediate cause of this action was President Jimmy Carter’s decision to allow Iran’s deposed Shah, a pro-Western autocrat who had been expelled from his country some months before, to come to the United States for cancer treatment. However, the hostage-taking was about more than the Shah’s medical care: it was a dramatic way for the student revolutionaries to declare a break with Iran’s past and an end to American interference in its affairs. 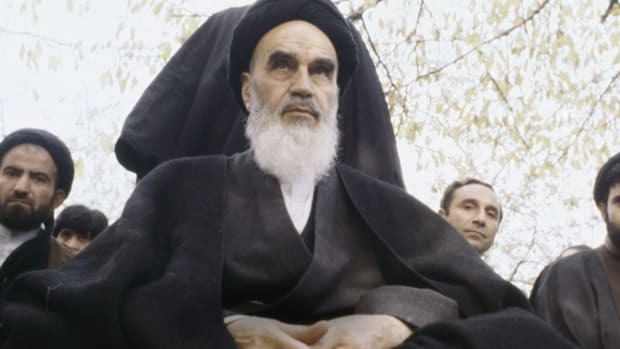 It was also a way to raise the intra- and international profile of the revolution’s leader, the anti-American cleric Ayatollah Ruhollah Khomeini. 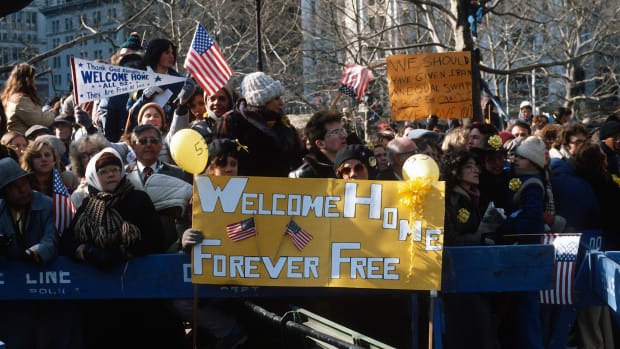 The students set their hostages free on January 21, 1981, 444 days after the crisis began and just hours after President Ronald Reagan delivered his inaugural address. 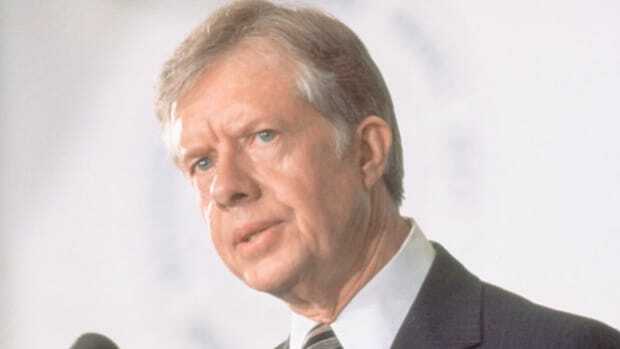 Many historians believe that hostage crisis cost Jimmy Carter a second term as president. The Iran hostage crisis had its origins in a series of events that took place nearly a half-century before it began. The source of tension between Iran and the U.S. stemmed from an increasingly intense conflict over oil. 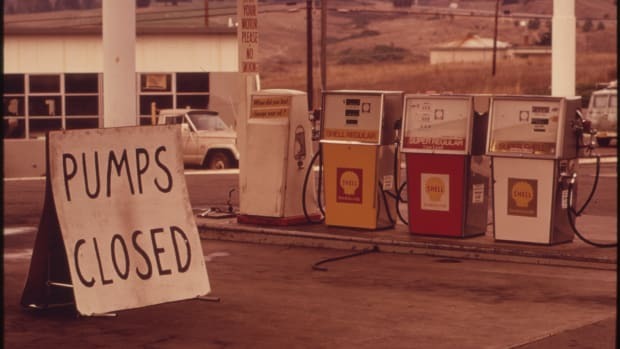 British and American corporations had controlled the bulk of Iran’s petroleum reserves almost since their discovery–a profitable arrangement that they had no desire to change. However, in 1951 Iran’s newly elected prime minister, a European-educated nationalist named Muhammad Mossadegh, announced a plan to nationalize the country’s oil industry. In response to these policies, the American C.I.A. and the British intelligence service devised a secret plan to overthrow Mossadegh and replace him with a leader who would be more receptive to Western interests. Did you know? 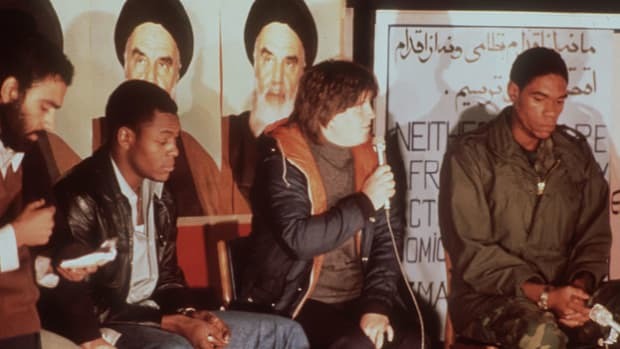 The television series Nightline began as a nightly news report on the hostage crisis (its original title was The Iran Crisis--America Held Hostage). ABC News president Roone Arledge hoped that it would draw viewers away from the NBC juggernaut The Tonight Show with Johnny Carson. Through this coup, code-named Operation TP-Ajax, Mossadegh was deposed and a new government was installed in August 1953. The new leader was a member of Iran’s royal family named Mohammed Reza Shah Pahlavi. The Shah’s government was secular, anti-communist and pro-Western. In exchange for tens of millions of dollars in foreign aid, he returned 80 percent of Iran’s oil reserves to the Americans and the British. For the C.I.A. and oil interests, the 1953 coup was a success. In fact, it served as a model for other covert operations during the Cold War, such as the 1954 government takeover in Guatemala and the failed intervention in Cuba in 1961. However, many Iranians bitterly resented what they saw as American intervention in their affairs. The Shah turned out to be a brutal, arbitrary dictator whose secret police (known as the SAVAK) tortured and murdered thousands of people. Meanwhile, the Iranian government spent billions of dollars on American-made weapons while the Iranian economy suffered. By the 1970s, many Iranians were fed up with the Shah’s government. In protest, they turned to the Ayatollah Ruhollah Khomeini, a radical cleric whose revolutionary Islamist movement seemed to promise a break from the past and a turn toward greater autonomy for the Iranian people. In July 1979, the revolutionaries forced the Shah to disband his government and flee to Egypt. The Ayatollah installed a militant Islamist government in its place. The United States, fearful of stirring up hostilities in the Middle East, did not come to the defense of its old ally. (For one thing, President Carter, aware of the Shah’s terrible record in that department, was reluctant to defend him.) However, in October 1979 President Carter agreed to allow the exiled leader to enter the U.S. for treatment of an advanced malignant lymphoma. His decision was humanitarian, not political; nevertheless, as one American later noted, it was like throwing “a burning branch into a bucket of kerosene.” Anti-American sentiment in Iran exploded. 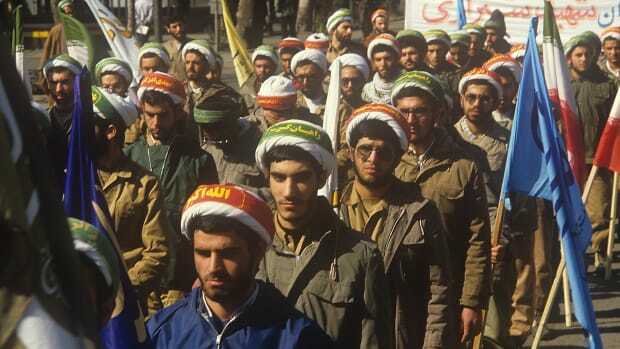 On November 4, just after the Shah arrived in New York, a group of pro-Ayatollah students smashed the gates and scaled the walls of the American embassy in Tehran. Once inside, they seized 66 hostages, mostly diplomats and embassy employees. After a short period of time, 13 of these hostages were released. 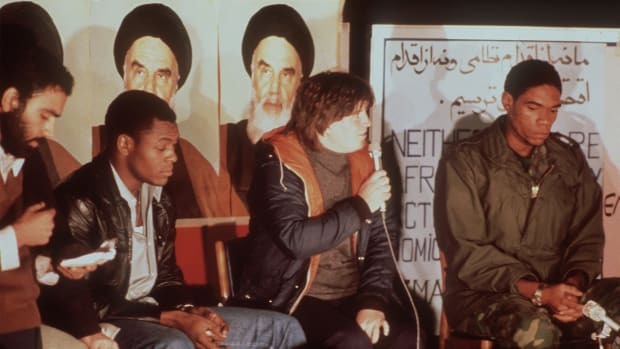 (For the most part, these 13 were women, African-Americans and citizens of countries other than the U.S.–people who, Khomeini argued, were already subject to “the oppression of American society.”) Some time later, a 14th hostage developed health problems and was likewise sent home. By midsummer 1980, 52 hostages remained in the embassy compound. Diplomatic maneuvers had no discernible effect on the Ayatollah’s anti-American stance; neither did economic sanctions such as the seizure of Iranian assets in the United States. Meanwhile, while the hostages were never seriously injured, they were subjected to a rich variety of demeaning and terrifying treatment. They were blindfolded and paraded in front of TV cameras and jeering crowds. They were not allowed to speak or read, and they were rarely permitted to change clothes. Throughout the crisis there was a frightening uncertainty about their fate: The hostages never knew whether they were going to be tortured, murdered or set free. President Carter’s efforts to bring an end to the hostage crisis soon became one of his foremost priorities. In April 1980, frustrated with the slow pace of diplomacy (and over the objections of several of his advisers), Carter decided to launch a risky military rescue mission known as Operation Eagle Claw. The operation was supposed to send an elite rescue team into the embassy compound. However, a severe desert sandstorm on the day of the mission caused several helicopters to malfunction, including one that veered into a large transport plane during takeoff. Eight American servicemen were killed in the accident, and Operation Eagle Claw was aborted. The constant media coverage of the hostage crisis in the U.S. served as a demoralizing backdrop for the 1980 presidential race. President Carter’s inability to resolve the problem made him look like a weak and ineffectual leader. At the same time, his intense focus on bringing the hostages home kept him away from the campaign trail. The Republican candidate, former California governor Ronald Reagan, took advantage of Carter’s difficulties. Rumors even circulated that Reagan’s campaign staff negotiated with the Iranians to be sure that the hostages would not be released before the election, an event that would surely have given Carter a crucial boost. (Reagan himself always denied these allegations.) On Election Day, one year and two days after the hostage crisis began, Reagan defeated Carter in a landslide. On January 21, 1981, just a few hours after Ronald Reagan delivered his inaugural address, the remaining hostages were released. They had been in captivity for 444 days.